Treat yourself to the sparkle of this stunning Caviar Pearl and Swarovski Crystal Floral Cocktail Ring. 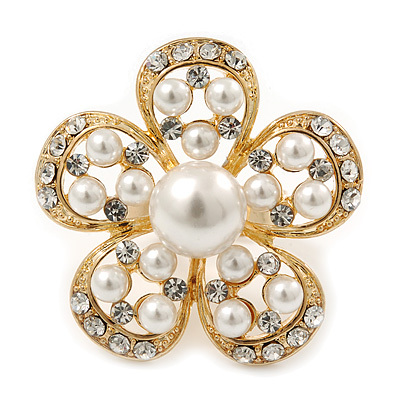 The ring features a beautiful caviar set white pearl flower shaped station, accented with clear Swarovski crystals. The ring itself is gold plated, with a 4mm wide expandable bracket band.The flower station measures 30mm from top to bottom. Add this charismatic ring to your ensemble for a look that is fun and extremely feminine.